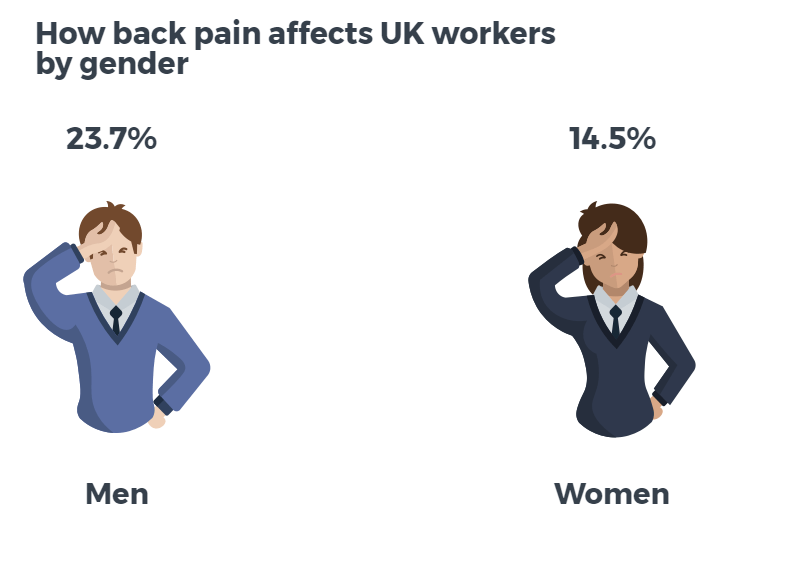 According to the Office of National Statistics, of the 137 million working days lost to sickness in 2016, 30.4 million working days were lost to health complaints attributed to musculoskeletal conditions. 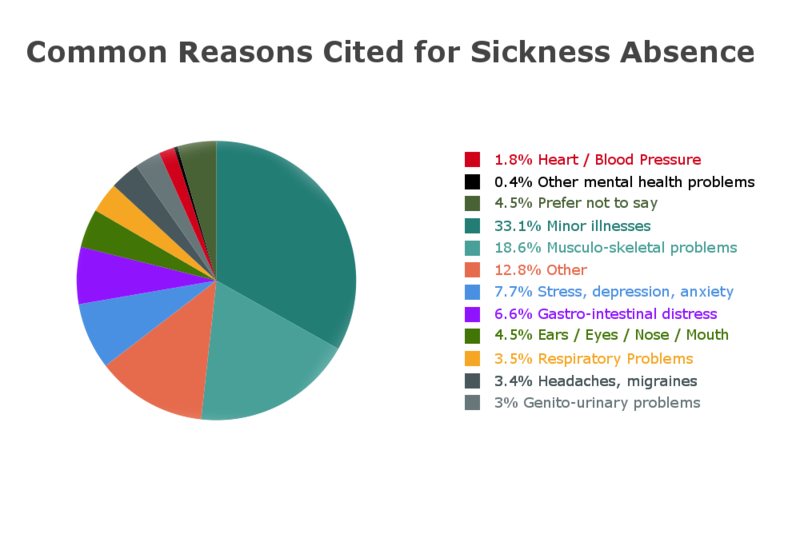 In addition, back and neck problems were the second most common reason cited for people taking time off work. Below is a breakdown of the most common reasons UK workers give for taking time off work. Nowadays almost everyone has a phone or a computer. According to Ofcom, as of March 2016, the average person in the UK spends 30 hours and 42 minutes a month browsing online using a desktop or laptop. 66% of people also use a mobile handset to access the Internet and 93% of UK adults own a smartphone. However, prolonged use of a smartphone, tablet or computer has been proven to have negative effects on our overall posture and spinal health. These can include. “Text neck” – the posture we adopt when looking at our phones can put further strain on the muscles of the neck, adding to the effective weight of heads on our neck. For example, tilting your head at a 45 degree angle can add the effective weight of your head to 45 pounds. A study by Dr Kenneth Hansraj has argued that 700-1400 hours of excess stress has been placed on the cervical spine by increased phone use. Side-effects of this can include neck pain, head pain and numbness. If you use a computer frequently at work, then ask your employer to provide you with a desk assessment. If you work from home, or work alone, then consult your GP, a phyical therapist, or an osteopath to ensure that you are looking after your posture. If you use a laptop for long periods of time, then use a separate keyboard and mouse which will allow you to sit up and be less hunched over. Ensure you take regular breaks from your phone, laptop or tablet. Regular stretching can help to alleviate some of the discomfort you may be experiencing. You may also be able to seek advice from a manual therapist or osteopath for advice on how to best look after your posture and spine. A recent Guardian report revealed that British people sit for 8.9 hours a day, and a study by Public Health England. Research has long linked excessive time spent sitting to increased risk of morbidity or premature death. Public Health England recommended that British workers should spend between two and four hours a day standing. Prolonged sitting can lead to poor circulation, compression of the spine and tightness of the hips. Heightened physical stress can also increase the likelihood of low moods and mental stress. Workers who spend a long time sitting down are more than twice as likely to develop type 2 diabetes and cardiovascular disease, and a 17% increased risk of cancer incidence. Some employees and self-employed workers can take advantage of sit/stand desks allowing users to alternate their movements throughout the day. Once again, taking a break to go for a walk and stretch your legs is vital for circulation and posture. Similarly, if you are spending a lot of time driving as part of your job, regular breaks are vital. A manual or physical therapist will be able to advise on the causes of back pain and best course of treatment and rehabilitation for people who spend a lot of time in sedentary work. Whilst the physical benefits of regular exercise are usually wholly positive, exercising too strenuously can also cause stresses and strains for the body. For example, injuries can often occur in contact sports such as football and rugby, winter sports such as skiing and snowboarding and extreme sports. Exercise can also be a cause of pain of back or joint pain because you are not wearing the right equipment, shoes or clothing, or simply employing the correct techniques in whatever sport you happen to be playing (e.g. golf, squash, cycling, dancing, weight lifting). Always be adequately prepared for whatever competitive sport you happen to be playing, ensuring that you are investing in the right clothing, equipment, shoes and employing the correct techniques in whatever sport you happen to be playing. Make the most of expert advice, be it a coach or instructor to avoid injury, or a manual therapist or osteopath if you happen to be playing it. Try to take advantage of the rehabilitative treatments which are on offer. Sports massage, deep tissue massage and osteopathy are worth consideration if you find yourself suffering from sprains, strains or tensions as a result of strenuous exercise. If you do suffer an injury or experience physical strain or discomfort, it’s important to see a medical professional, or manual therapist as soon as possible. Depression, anxiety or stress can all have very real and serious physical manifestations, whether it’s in our posture, our respiratory or digestive system, or our skin. All are common reasons for neck pain, back pain or physical stresses and strains, headaches, dizziness or poor diet. At some point in our lives we will come across stressful situations, which may possibly trigger episodes of stress, anxiety or depression. All three are risk factors for the onset of lower back pain. Try to get to the source of what is making you stressed and anxious. Then, if possible, try to eliminate these factors. It may be that you have suffered from a recent trauma or grief, which will be having a very real and understandable impact on your health. Alternatively, the source of your stress may be environmental – perhaps you are struggling at work or at home. Getting to the root of what is causing your stress, anxiety or depression is sometimes easier said than done. This is why it’s important to visit your GP at the earliest possible opportunity. They may recommend seeing a therapist or counsellor. Take some time out from your schedule to undertake breathing exercises or meditation. It’s also worth looking at mindfulness, which has become an increasingly popular way of minimising both physical and mental stress. Since stress and anxiety have been known to cause musculoskeletal problems, it’s also worth taking advantage of a deep tissue massage, hot stone massage or aromatherapy treatment, as this can help to relieve the physical manifestations of stress, anxiety or depression. Whether we’re lying or sitting down, the furniture we use in our everyday lives can cause us back pain without our realising it, especially if the furniture is not correct for your particular body type or posture. It may surprise you how many musculoskeletal tensions and stresses are caused by an inappopriate sofa, chair, pillow or mattress. Posture and furniture are two factors we are often asked about here at Bodytonic. Make sure your mattress is the right fit for your back, as a poor quality mattress is often one of the most common reasons for back pain and muscle tension. There are a number of things you can do to make sure your mattress is providing you with the support you need. Firstly, make sure you shop around at a few shops and showrooms and get some expert advice before you buy. Secondly, make sure you talk to a physical therapist; they can advise you on what is the best purchase for your particular posture. The same is true for pillows; a manual or physical therapist can advise you on the best pillow purchase to help your posture and ensure the best night’s sleep. And as we mentioned above, shopping around and trying out different pillows before you buy will not do you any harm. Make sure that all the sofas and chairs in your house are providing adequate support for your back. If they are old, or in need of replacement, then do so as soon as possible. Use cushions to add extra support to your sofa or chair if needs be. Perhaps one of the biggest causes of unexpected back pain, muscle stress or strain is weight gain and/or obesity. According to the NHS, joint and back pain are one of the numerous problems associated with obesity. Obesity and weight gain mean that breathlessness and an inability to do physical activity are more likely, which will in turn heighten the likelihood of physical strain and muscle ache. Tackling obesity is best achieved through eating healthily, reducing calorie intake and partaking in regular exercise. You may wish to book an appointment with a GP, or weight loss professional (e.g. dietician) to help plan a weight loss programme. Joining a weight loss group or running club, or even your local gym, are all great ways to structure your weight loss and encourage physical and mental well-being. The common thread which has linked together the six other posts in this blog, is the importance of posture. Everybody has a different posture and there is no “perfect” posture. Whilst some people will have very specific postural complaints, some will have developed complaints arising from any number of contributing factors and environmental issues discussed in this blog. These can include laptop/tablet/phone use, stress and anxiety, lack of physical activity/exercise or uncomfortable furniture. Posture is absolutely key to your physical and mental well-being, and whilst the perfect posture may seem a distant aspiration, it is something to strive for as you. As well as following the advice mentioned above, it’s always useful to remember that trained professionals such as osteopaths and physiotherapists can advise you on the cause of pain and discomfort and on the correct treatment/rehabilitation for you. It’s also worth considering your daily habits, and any external factors which may be affecting your posture overall. We have already covered the importance of comfortable furniture and a firm mattress; however it’s also worth mentioning the importance of carrying a backpack/satchel properly. Failure to do this can create spine and posture problems over an extended period of time.